Prior to fishing at these lakes, make sure that you have the appropriate licenses and are familiar with the governing agency's fishing regulations for that particular lake. Completed in 1963 after a six-year construction on the San Juan River, the earth and rock-filled dam is nearly 0.75-miles long and 400 feet high. It is the central amenity of Navajo Lake State Park and has a world class reputation for outdoor adventure and fishing. Covering 14,500 acres and the second largest lake in New Mexico, Navajo Lake is ideal for a day of fishing, swimming, scuba-diving, water-skiing, wildlife viewing, and hiking or for a week of camping and boating. Navajo Lake State Park is the ultimate playground for adventurers with 150 miles of shoreline and over 280 days of sunshine and spectacular scenery. During the day, explore the beautiful network of canyons by boat or fish the famous San Juan River. At night, settle in by the campfire and sleep under the mesmerizing New Mexico star filled sky or enjoy the home-away-from-home comforts at one of the popular lodges. Navajo Lake is a large and fantastic lake for boating and can accommodate any size boat. For an up-close, intimate exploration of Navajo Lake, tour the canyons by kayak or sailboat. Kick back and enjoy the scenery from a pontoon boat or if you prefer a faster paced adventure, you can explore the waters by cabin cruiser or speedboat. Water-skiing, jet-skiing and wake boarding are also popular. The Navajo Lake Marina and Sims Marina are full service marinas providing fuel, food, boat, slip and pontoon rentals. There are also two boat docks and boat ramps for easy launching. Two Rivers Marina is a third marina located along the northern shoreline in Colorado. If you are looking to spend a few nights by the campfire under a canopy of stars, Navajo Lake State Park features seven campgrounds with over 240 developed campsites. Campgrounds are located near each marina and along the San Juan River. Campsite amenities range from basic to full service. The Park Visitors Center is located on the west side of the lake near Navajo Lake Marina. For campground reservations and options book online or call (877) 664-7787. If you prefer to scout your own rugged location away from others, primitive camping is also allowed throughout the park along the canyons and lakeshore. Fishing is a popular activity throughout the year at Navajo Lake which is a year-round fishery for rainbow and brown trout, Kokanee salmon, northern pike, large and small mouth bass, bluegill, crappie, perch, and catfish. Many state records are held by the fish and fisherman of Navajo Lake. Anglers fish by boat and from the shoreline, marinas and dam. World-class trout fishing can also be experienced along the San Juan River. A 4.25 mile section of special catch and release waters located at the base of Navajo Dam, known as Quality Waters, brings anglers from around the world. The average San Juan River Quality Waters trout measures over 17 inches. Water conditions of this section are perfect for fishing summer, fall, winter and spring. It's no secret that anglers from across the world visit Navajo Lake State Park every year for the world-class fly-fishing found along the San Juan River at the base of Navajo Dam. However, did you know that Kokanee salmon season runs from October 1 to December 31? Because of the generous bag limit, salmon lovers rarely miss a season. Kokanee are land-locked sockeye salmon. While not native to the Southwest, Kokanee salmon thrive in deep and cold lakes like Navajo Lake. Every fall season, large schools of adult Kokanee gather to spawn along the shoreline of Navajo Lake. The bag limit is 12 Kokanee per day, with 24 in possession. Snagging at Navajo Lake is only permitted during the special Kokanee salmon snagging season. For an up-close-and-personal tour of Navajo Lake State Park, a hiking or mountain biking trip is recommended. The beautiful high desert landscape offers exciting areas to explore. The park is perfect for an easy, family-friendly ride or hike as well as a challenging adventure for more experienced hiking and riding. Three miles west of Navajo Lake is Simon Canyon Recreation Area, which offers 3,900 acres of breathtaking scenery and a variety of wildlife. Simon Canyon is a beautiful area to hike and nature watch. The mouth of the canyon is off the San Juan River, where a parking lot, picnic table, and restrooms are available. Hikers will discover Simon Ruins which is a Navajo Pueblito overlooking the canyon drainage. Built in 1754, this ruin is the only "boulder type" defensive site north of the San Juan River. Contact the BLM Field Office for additional information, (800) 842-3127. 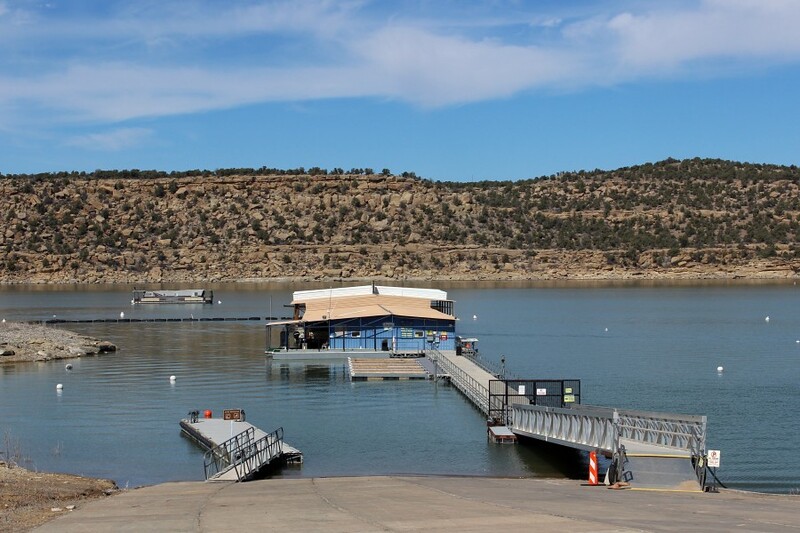 Located on the southern end of the reservoir, in the Pine Site of Navajo Lake State Park, this marina offers guide service, boat rentals, a supply store and restaurant. 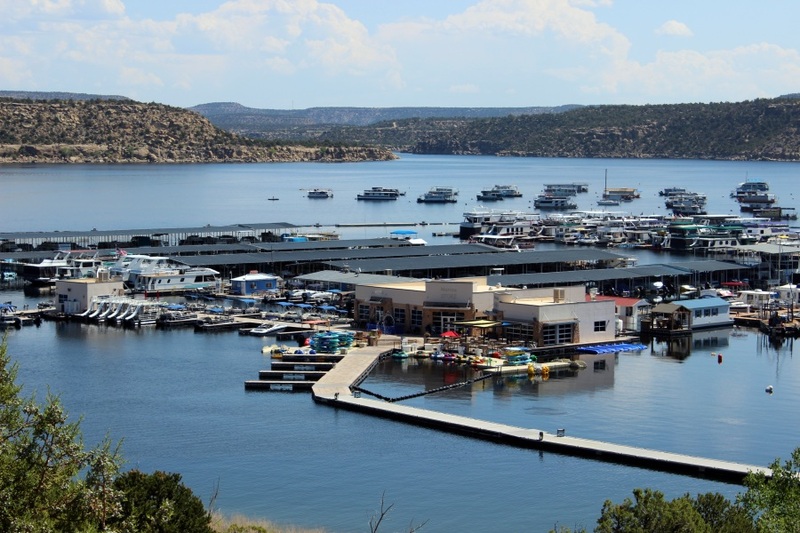 This marina is the hub of activity at Navajo Lake, and the perfect place to begin your stay. The staff is knowledgeable and equipped to help you discover what you are looking for, from where the fish are biting to arranging a boat rental or professional fishing guide. No matter your preference, speed or leisure Navajo Lake Marina has a boat for you. Camping is available along several camping loops (Pine, Juniper, and Cedar) up from the marina. A total of 91 camp sites are available. Navajo Lake Marina hosts the Galley Grill and Marina Store to service your needs. The Galley Grill offers the perfect place for an enjoyable meal on the lake. The Marina Store carries just about everything you could possible need while visiting the lake - groceries, fuel, fishing tackle and bait, and even safety equipment. The Marina is located at the end of New Mexico County Road 527 east and opposite shore of Navajo Lake Marina, just below Sims Mesa Campground. Camping is available at Sims Mesa Campground which has 44 camping sites. Open from May to September. The Marina store carries groceries, ice, bait & tackle, camping and boating supplies. The Marina Store is closed during the off season. 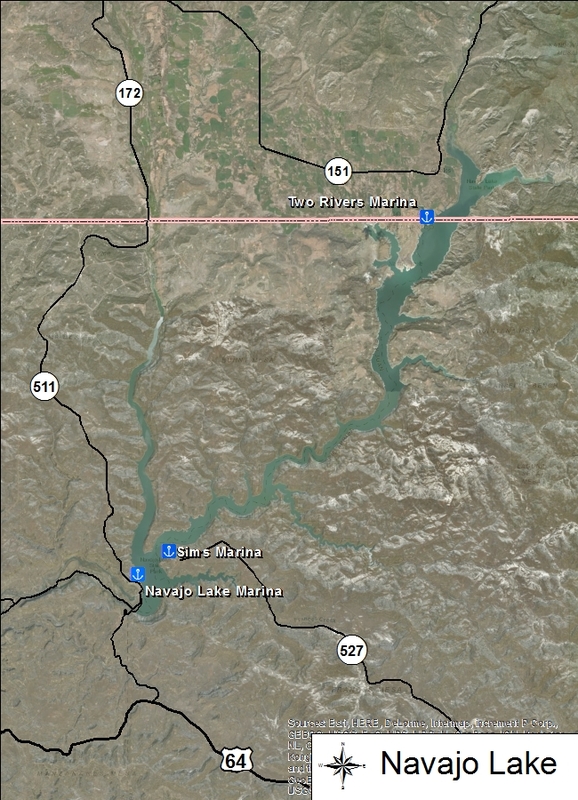 The Two Rivers Marina is located in Colorado where the Piedra and San Juan rivers meet. Over 120 campsites, showers and vending machines. Cabins also available. The Marina store sells fuel, ice, tackle, accessories, cold drinks and has clean restrooms.